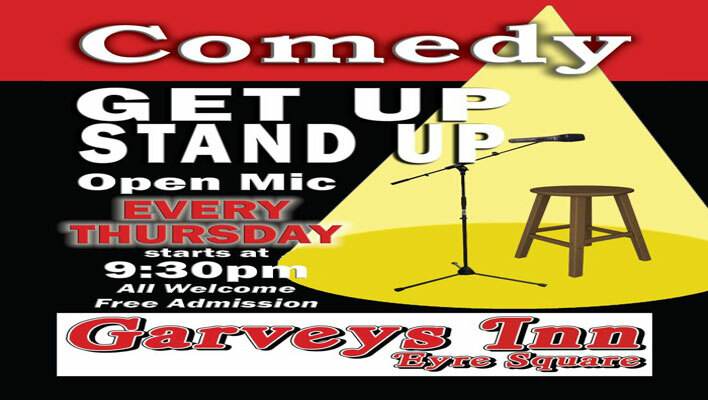 “Get Up, Stand Up”, was a stand up comedy open mic night at Garvey’s Hotel and Bar in Eyre Square, Galway. It was a weekly event, held every Thursday, and was open to all public and comedians. The night was FREE ENTRY! The doors opened at 9:30pm and the first act went on at 10:00pm. Every Thursday there was a great line up of gutsy up-and-coming comedians performing to lively crowds. Each comedian was allowed seven to eight minutes for his or her set… So if the jokes we re seriously cringe worthy you didn’t have to endure them long. The night ended on the 25th of October 2012 to a packed crowd.